Hiroshima Johoku Gakuen is a private boys' junior and senior high school with over one thousand three hundred students. Located to the north of Hiroshima City in the suburb of Hesaka, the school stands high on a hill with magnificent panoramic views of the Ota River and the town below. It is located on spacious grounds, and has modern buildings with state of the art facilities. Our school prides itself on fifty years of academic excellence. The school offers a six-year program that is aimed at preparing students for entry into prestigious universities. It strives to produce mature, well-rounded young men who are equipped to make significant contributions not only locally, but also nationally and internationally. 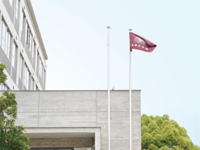 At Johoku, students are encouraged to become active members of the school community, and are given every opportunity to take part in all school activities, including extra curricular activities such as sporting and cultural endeavors. A strong emphasis is also placed upon international understanding and education. Every year, students are given the opportunity to take part in a number of international exchanges with our sister schools in Australia and Korea, and our affiliated school in England. Through these international exchanges students develop good communication skills, and come to fully respect and understand other cultures. As a school we are proud of our strong sense of community, sound moral values, a commitment to realizing the potential of each and every young man, and in providing a balanced education that addresses the academic, social, emotional and physical well being of our students. If you are planning to visit Johoku, please be assured you will be welcomed with open arms by staff and students alike.If you are planning to visit Johoku, please be assured you will be welcomed with open arms by staff and students alike.